If you are in the mood to splurge a bit, this Southwest Turkey Bacon Burger Recipe is the one to try. Each quarter pound burger is 9 Points and is topped with cheese and bacon, and is made with Frank’s RedHot Sweet Chili Sauce. The flavors of this turkey burger recipe are so incredible….it’s easy to forget that you are eating turkey. If you’d like, you can cut down on the Points of this burger a bit, by eliminating the cheese and or the sweet chili sauce. Though, I LOVE cheese burgers and could never imagine eliminating the cheese. And I like the sweet chili sauce because it helps give the turkey burger a unique and delicious flavor. 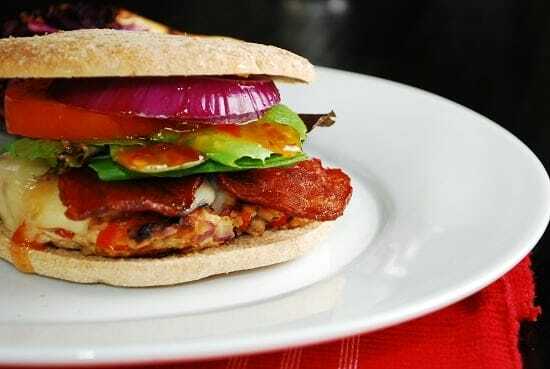 So for me, I pair this Southwest Turkey Bacon Burger with some 0 Points roasted veggies or a light salad, and feel that I’m getting my Points worth with this recipe. Just make sure not to overcook your turkey burgers or they can become a bit dry. Definitely a Weight Watchers Turkey Burger that I’ll be making frequently! This decadent, quarter pound, spicy bacon cheeseburger has everything you could ask for in a turkey burger recipe. Loaded with flavor, fiber and a lot less fat and calories than you’d find in the restaurant version. In a large bowl, combine turkey, minced garlic, minced onion, cilantro, red bell pepper, paprika, jalapenos, chili sauce, tabasco sauce, liquid egg substitute, cumin, salt, pepper. Divide into 4 patties. Spray a skillet or grill with nonstick cooking spray and set over medium high heat. Cook each patty for about 4-5 minutes on each side, or until center is no longer pink. Use a lid to cover the pan to help keep some juices inside the meat. During the last minute of cook time, add a slice of cheese to each patty, and then place the lid back on. Place each cooked cheeseburger onto a bun and top with 1 slice of bacon, tomato, lettuce, red onion, and a drizzle of the remaining tbsp of Frank’s RedHot chili sauce. I’m slightly confused. Should #2 in the directions even be there? Cook the turkey and then set it aside? Then what is it I’m then putting into the skillet to cook? Yowsa! That’s a doozy of a typo! Fixing it right now. Thanks for catching that! This sounds like a flavorful “must make”/”must try” recipe. So, I HAD to add it to my ZipList. Thank you SO MUCH for sharing it! Ground turkey can always use some spice-attention and your recipe gives it just that. Yummers! Made these last night & they were amazing. Althought I couldn’t find the Frank’s RedHot Sweet Chili Sauce, they still tasted very good.